Over the past few years – particularly since Vladimir Putin’s 2012 return to presidency – the Russian Government has cracked down on NGOs, often by accusing them of being ‘foreign agents’ due to their ‘political activity’. ADC Memorial was forced to choose between officially registering as a ‘foreign agent’ or closing down for submitting a report to the UN Committee against Torture in the lead up to Russia’s 2012 review by that body. As the label of ‘foreign agent’ would greatly restrict the work ADC Memorial was able to carry out, it made the difficult decision of closing the organisation down in 2014. Since then, ADC Memorial has been operating without official Russian registration. Stephania has a positive outlook on her previous interactions with the UN, acknowledging that the UN has done their utmost to stop the criminalisation of human rights defenders. ‘We’re very grateful for all the support that we’ve received from various treaty body committees that we’ve worked with; they’ve all recognised the work of civil society and given meaningful recommendations in the framework of their mandate.’ However, the political reality of the UN’s influence is not always as effective. 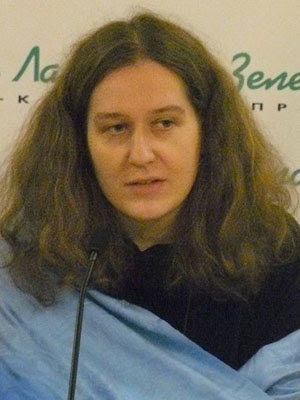 ‘It’s very difficult to oppose Russian politics, even at the level of the United Nations.’ Stephania is now looking outward to bring domestic change to Russia, as anti-discrimination laws now seem ‘unlikely – although pressure on the Government will continue.’ She hopes to find some success in international courts, citing potentially useful precedents at the European Court of Human Rights in cases regarding migrants and stateless people. This entry was posted on	January 8, 2016 at 16:22	and is filed under human rights, Human Rights Defenders, ISHR.